On this page are presented various software projects I have worked on over the past years. A node based sound editor, written entirely in C#. Technical demo does resampling and filtering effects, as well as mixing, upmixing and downmixing of channels, and visually displays a high quality spectrum view of the output sound in realtime. 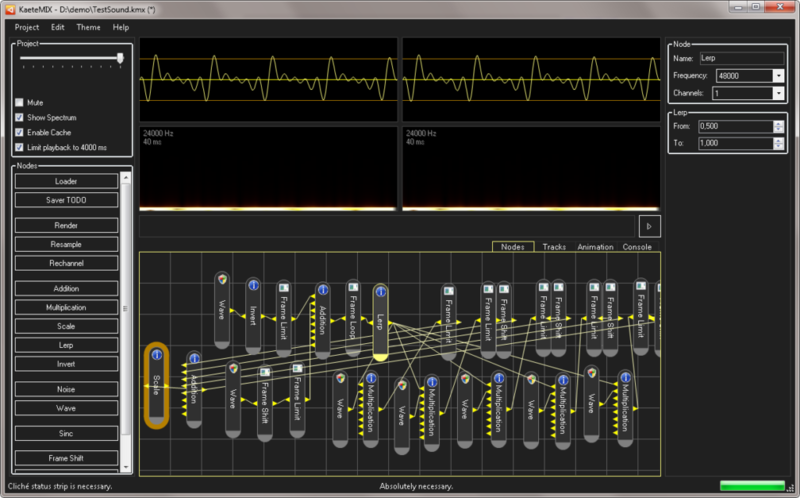 It supports reading PCM wav files as audio input format, and undo/redo functionality is present. Audio is played back trough custom bindings to the WASAPI interface. The user interface has support for color themes. For any inqueries in regards to sound related programming, send me an e-mail. Own work, personal software project. An application for easy and automatic translation of software application executables, making use of the Google Translate and Bing Translation APIs. The translations are cached in an online database, where users can suggest new translations trough a voting system. Users do not need any application source code for creating a translated version. Translations are made from MFC string resources, as well as from supported vendor specific text resources used in certain proprietary software. Availability: Client as freeware on dedicated download page. Web interface back-end available here for use. Interested in a software solution like this? Send a detailed description of your needs, and we can negotiate. A lightweight internet speed testing client. 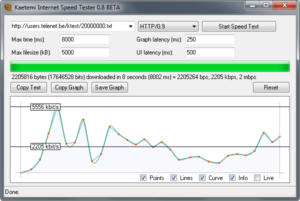 The user’s connection speed is tested using a simple HTTP download, which can optionally be saved to the hard disk drive. When the download completes, the user can save the graph as an image file in order to share it online. An IRC client written in C# .net with full support for most basic and extended IRC features, such as the ability to join different channels, and open query windows, as well as colored text and ctcp messages. Availability: Source code on GitHub, unfinished but works. Own work, personal research project, reverse engineering. An experimental project consisting of random bits and pieces of code intended for tools to extract files from certain digital recorders’ hard drives, and potentially allow replacement of these hard disks with larger models. Availability: Source code on Google Code, provided as is, highly experimental. Own work, personal research project. An experimental reverse image search engine on top of a custom http server in C#, where the user gives an url to an existing image on the web, and is presented with a list of resembling images after a few milliseconds. The system contains a webspider capable of scanning the web for images, with specific rules for improving performance on various image hosts. Own work, personal software library project. An almost fully featured high performance HTTP server in C# from scratch on top of the basic TCP socket classes. The software consists of a HTTP library purely handling the HTTP protocol, with some extra utility functions such as sending files, directory indexes and error pages, as well as a higher level fileserver style system controlled trough configuration files with support for plugins. Available plugins are for adding CGI support, confirmed to give a fully working PHP or Perl website environment, as well as a plugin for adding IronPython scripting support. The Hytra library has been used to power the above mentioned Reverse Image Search system. Own work, software project for business user. 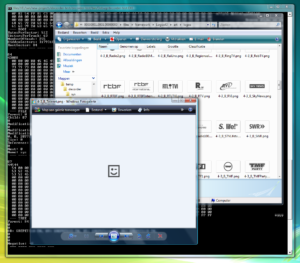 Lock down a Windows desktop system to run only a specified application. The keyboard can be locked down to stop the user from shutting down the application. In case the client’s application crashes, and shuts down, the tool will automatically restart the application. A security key sequence can be configured to shut down the kiosk lock. Availability: Custom built to specification on demand. Own work, software project for Belgacom International Carrier Services. A window manager for the NOC at BICS in C# using the .NET framework in combination with native Win32 calls. The application runs fullscreen or windowed with support for automatically switching embeddable tabs, row and column splitters, self-refreshing browser windows, taking control of running application windows, RSS feed ticker, and various other tools. Only a minimum of the available screen space is used by the window manager itself, hiding all internal functionality in context specific right-click menus. The application’s state can be saved, so that the configured views can be automatically reloaded in case the machine has to be restarted. Availability: Not available, IP owned by BICS. In need of a similar tool? Drop me an e-mail. Software for manually modifying Ryzom Ring game mission scenario files. Feel free to contact me if you are interested in a customized tool for safely investigating and modifying the raw data of a specific file format. Own work, personal tool, reverse engineering, no support provided. Tool for exporting landmarks from character configuration files of the Ryzom game to an XML file. Landmarks can be re-imported into a different character configuration file. Availability: Freeware, provided as is, direct download. 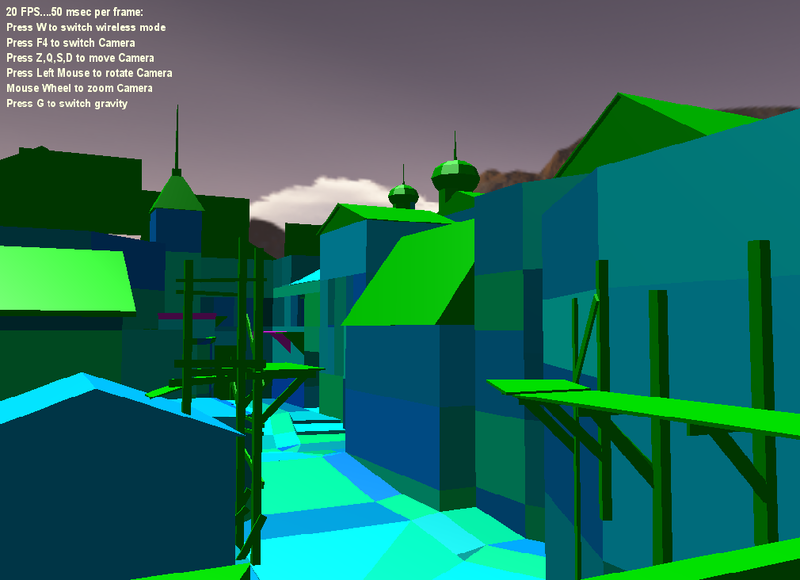 Own work, student project, uses university’s DirectX wrapper framework. Reads in VMF files created using the Valve Hammer level editor, and converts convex plane based solids to renderable polygons. Learn to read a different writing system. 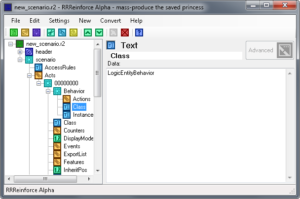 The user is presented with a randomized list of foreign characters, and has to type them in his native character set. When a mistake is made, the window will immediately flash red, make a loud beeping noise, and allow the user to try to correct his mistake. The user can also ask for a hint in case he does not know the given character. Own work, personal tool, no support provided. Calculates the CRC32 checksums of all files in a folder, and displays them in the console window. Software solution for using a single Mouse and Keyboard Input device from one Windows based PC on multiple PCs at the same time. The mouse cursor can be moved from one PC’s monitor onto another’s in the same way, as if the other monitor was directly connected to the same PC. This avoids the need of multiple keyboards on the user’s desk when working with more than one PC at the same time. Availability: Not available, unfinished, functionality incomplete. Is this something you would like to see? Contact me with your business proposal. Own work, personal utility software. 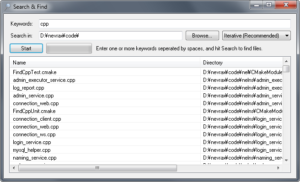 Tool to search and find files by case insensitive keywords contained in the filename. It searches directly trough the filesystem using a search strategy of choice. Are you interested in made-to-order software utilities like this? Get in touch! Fullscreen tool to test your monitor for dead pixels, by lighting the screen up in one single color of choice. The tool can be set to automatically switch between colors. Warning: May be harmful to people suffering from epilepsy, use at own risk. Copies a file or folder, ignoring any read errors that may occur. Useful for recovering useable portions of files from broken CD or floppy media. Easy to use tool to create a TCP tunnel to another machine on specific ports. Configuration tool for setting up multiple static IPs simultaneously with one automatically assigned by DHCP on one single network interface. Scripted interactive movie player with playback from multiple simultaneous and switchable video streams. Software composed of a Windows service and a C# command line tool for creating an entire hard disk image from a remote computer. Sends e-mail reports on success or failure. 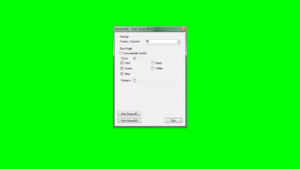 A tool is included for converting the image for use within Virtual PC. For any unrelated programming work, you can contact me as well with a description of your project, and we can discuss further from there.